A tankless water heater not only eliminates the need for a bulky storage tank, it's a great way to reduce your household energy costs. Everyone is talking about “on demand” these days, but the buzz has moved well beyond movies and videos and into the world of plumbing with the increasing popularity of tankless water heaters. Tankless water heaters provide hot water on an as-needed basis, thereby eliminating bulky and inconvenient storage tanks and saving energy at the same time. Unlike conventional water heaters, which may hold 40 to 50 gallons of hot water ready at all times, tankless water heaters save energy by producing hot water only when needed. Tankless water heaters can, in fact, be 24 percent to 34 percent more efficient than a traditional tank-style water heater, depending on a home’s daily hot water demand, according to the U.S. Department of Energy’s Energy Efficiency & Renewable Energy Web site. 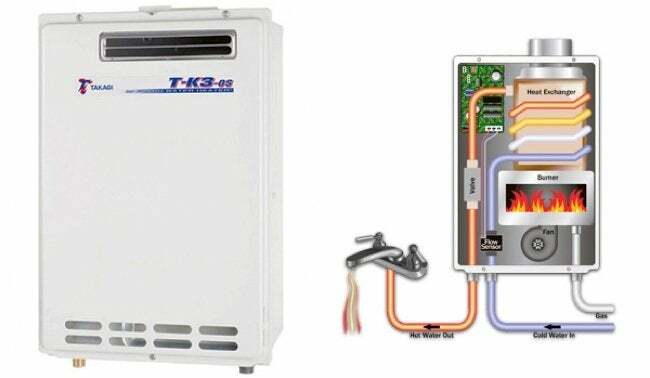 There are many different sizes and styles of tankless water heaters, including electric, natural gas, and propane, in single-room or whole-house sizes. Generally, you can replace an existing conventional water heater with a similarly powered tankless unit, although there are a few considerations depending on the power source: For electric systems, you will need to address the additional voltage and amperage requirements of a tankless heater; for gas systems, there must be proper ventilation. Before purchasing a tankless water heater, you will need to determine your hot water usage, which is measured in gallons per minute (GPM), and figure out your maximum hot water demand. A typical shower requires about 2.5 GPM; dishwashers, washing machines, and other appliances all place additional demands on hot water production. Therefore, if you have multiple people showering or multiple appliances using hot water at the same time, you will need a larger water heater that delivers more gallons per minute. 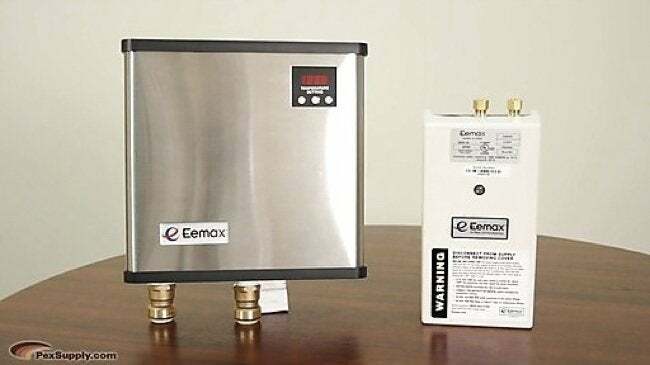 Tankless water heaters are typically more expensive than conventional models, with prices ranging from $600 to $2,000, plus installation; in comparison, a standard water heater runs between $300 and $1,000. However, a tankless water heater will last an estimated 20 years, versus a conventional water heater that will last 10 to 15 years. The average energy savings and additional lifespan make tankless heaters a viable option for many homes. In addition, many state and local utilities offer rebates and incentives for converting to energy-saving appliances, which can help mitigate the cost of installing a tankless system.